Cocoa producing areas lie near the equator. Bounded to the north and south by the Tropics of Cancer and Capricorn, this region of tropical rain-forests, with its moist, windless climate and constant warmth, provides ideal conditions for the growth and well-being of the cocoa tree. The cocoa tree may have originated in the Amazon basin of Brazil, or in the Orinoco Valley of Venezuela, or perhaps in Central America. Some regard Mexico and Ecuador as the original home of cocoa. The oldest plantations are in the northern areas of South America. At a later date, the cultivation of cocoa spread southward to Brazil. At the end of the nineteenth century, cultivation spread to the equatorial regions of West Africa. Today, the Ivory Coast and Brazil are the most productive areas in the world. Ghana, once the most important world producer, is losing its significance due to ageing plantations. Nigeria and Cameroon also produce cocoa. In the islands of South-East Asia, cocoa was established very early, but they produce small quantities of good cocoa. In the Far East, Malaysia has given a great deal of encouragement to the cultivation of cocoa. Baby this tree! There are several species of cocoa trees. They are very delicate and sensitive plants, and need protection from wind and sun. Although you will only find the trees in tropical climates, they require a fair amount of shade especially in their first four years. Cocoa seedlings are planted in fiber baskets or plastic bags in nurseries. In a few months they are ready for transplanting, container and all. Newly planted seedlings are always shaded by other trees. "Cocoa mothers" is the term to the many varieties of shade providing trees… banana, plantain, coconut palms, rubber trees, leguminous plants, lemon and baobab trees, to name a few. The first blossoms begin to appear after about two years…delicate pink sepals and yellowish-white blossom petals. In fertile soil conditions and with intensive husbandry, cocoa trees can grow in full sunlight once they are established. Cocoa plantations and estates are usually located in valleys or coastal plains, and must have evenly distributed rainfall, and rich, well-drained soil. Some five year olds become fruitful. With pruning and careful cultivation, the trees of most strains will begin bearing fruit in their fifth to eight year. With extreme care, some strains can be induced to yield good crops in the third and fourth years. The cocoa tree is an evergreen with large glossy leaves that are red when young. It’s a beautiful plant! Moss and colorful lichens are often found clinging to the bark… in some areas breathtaking baby orchids grow on the branches. Thousands of tiny waxy pink or white five-pedaled blossoms cluster together on the trunk and older branches. Less than 10% mature into full fruit. The trees blossom almost continuously; a fully grown specimen can sometimes produce as many as 50,000 or even 100,000 blossoms in one year. The fruit pods, somewhat football-shaped, are green, or sometimes maroon colored, and grow on the trunk of the tree as well as its main branches. They ripen into a golden color or take on a scarlet hue with multicolored flecks. Inside the pod, enveloped in the white fruit pulp and arranged in five rows are between 20 and 40 precious, almond-shaped cocoa beans. The annual yield per tree is between 20 and 30 fruit pods. 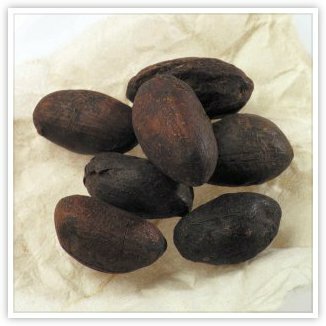 Each tree produces annually between 1 lb and 5 lbs of seed kernels, which we know as cocoa beans. Maximum yield is not usually achieved until the tree is about eight years old. At its maturity, the cultivated tree measures from 15 to 25 feet tall, since they are topped off for easier harvesting. The tree in its wild state may reach 60 feet or more. We know of some trees that are over 200 years of age, and although these trees have been around for over 4,000 years, no one has determined the real life span of the species. From a plantation owner’s perspective, the range usefulness of a tree is 25 to 40 years. The gnarled trees, have open grained wood which is usually only used as fuel. Criollo, the most elite of cocoas, has soft and thin-skinned pods, which are a light color. They have a very unique, pleasant mild aroma. The pure variety of the Criollo tree is found mainly in its native Equador and Venezuela, and some in Colombia, and parts of Asia. In the last 50 years all new plantings have been in Venezuela. Criollo cocoa accounts for only 10% of the world crop. It is particularly susceptible to climatic influences and is difficult to rear. Its yield tends to be smaller than that of other varieties and it takes longer to ripen. On the other hand, the seeds are of finer quality than any other variety, and the most exclusive and treasured chocolate comes from Criollo beans. Forastero, a more plentiful type and accounts for most of the world’s chocolate. This variety is easier to cultivate, has a thick-walled pod, and a pungent aroma. It’s a rather bitter, harsh type of cocoa. Depending on location, this variety produces qualities ranging from medium to fine, which are either selected or blended. Forastero trees originated in the Upper Amazon, but can be found in Brazil, West Africa, Ecuador, Latin America, Java, and Sri Lanka. Trinitario, which is believed to be a natural cross from strains of Criollo and Forastero, possesses a good, aromatic flavor. These trees are particularly suitable for cultivation in equatorial climates all over the world – Venezuela, neighboring South and Central American countries, the Caribbean, Indonesia, West Africa and Hawaii. As with most agriculture these days, growers have focused on hybridization to improve the quality of the bean and make the trees more resistant to disease. Recently, hybrid trees, using Amelonado cocoa trees and other specimens from the Upper Amazon, have been developed. They have a shown greater resistance, and have a richer yield. Scientists immersed in Twenty First Century biotechnology techniques are also working to improve the quality of cocoa beans and the plant’s resistance to disease. Although Chocolate is no longer used as currency, the cocoa tree continues to generate lots of revenue! Cocoa trees are fragile and harvesting is difficult. So soft is the bark of this tree, and so shallow are its roots, that tumbadores [pickers] cannot climb the tree to reach the pods on the higher branches. They use long handled steel knives to snip the highest pods without wounding the tree. Machetes are used for the pods growing within reach on the lower trunk. Just as the ripening of wine grapes is signaled by their change in color, cocoa pods turn bright red, orange or yellow at the peak of ripeness. Usually there is a main harvest season that lasts several months, and a mid-crop harvest lasting several more months. Climatic differences cause wide variations in harvest times with frequent fluctuations from year to year even within the same location. Cocoa trees bare fruit three or four times a year. They are in leaf continuously. Blossom, unripe fruit [pods] and also mature ripe fruit can be seen on the branches simultaneously, since the growing season in the tropics is continuous, due to the evenly distributed rainfall. A good breaker can open 500 pods an hour! Pods are collected in baskets and taken to the edge of a field where the pod breaking operation begins. One or two lengthwise blows from a well-wielded machete are usually enough to split open the woody shells. Anywhere from 20 to 50 cream-colored wet sticky seeds, called beans are scooped from each pod… approximately 400 beans are required to make one pound of chocolate. Exposure to air quickly changes the cream-colored beans to a lavender or purple. They don’t have the well-known fragrance of chocolate at this time. Beans must ferment to acquire the taste. The fermentation process is decisive in the production of high quality raw cocoa. The technique varies depending on the growing region. In some places the beans are placed in heaps, in others they are laid out in baskets or large boxes. The beans are usually covered with banana leaves and branches, or a layer of pulp from the pods. The covering starts to heat up and ferment the beans. The larger heaps are turned over several times to ensure even fermentation. In the course of the complex fermentation process, the cocoa bean undergoes a number of important changes. The sugar-containing fruit pulp, which would otherwise be difficult to dispose of, is broken down by ferments, and the astringent and bitter taste of the beans diminishes. Fermentation lasts from two to nine days… quite a wide range, and generates temperatures as high as 125 degrees Fahrenheit, killing the germ of the bean. Criollos need about two days. Forasteros and Trinitarios take a week or more. The timing is crucial… the beans should not ferment too long, or to be pulled from the pulp too quickly. The temperature also activates enzymes and forms compounds that produce the chocolate flavor when the beans are roasted. The true cocoa aroma develops later during the drying and roasting operations. In the final stages, the beans of the Criollo variety turn a brownish-yellow color, and those of the Forastero variety become violet-brown…a sign that the cocoa is now ready for drying. Drying is important to preserve the beans. After fermentation, the raw cocoa is still about 60% water. When the sun cooperates, the beans are dried by laying them on trays or bamboo matting to bask in the sun. When moist climate conditions interfere, the beans can be dried inside by hot-air pipes. With favorable weather the drying process usually takes several days. In this interval, farmers turn the beans frequently and use the opportunity to pick them over for foreign matter and flat, broken or germinated beans. During drying, beans lose nearly all their moisture and more than half their weight. They take on a browner colouring and the aroma has become more pronounced. 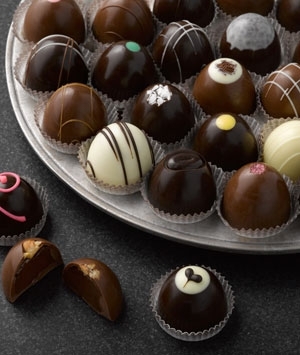 There are Cocoa Exchanges in New York, London, Hamburg and Amsterdam. Market price depends not only on the abundance of the worldwide crop and the quality of the beans, but also on the economic conditions throughout the world. Buyers sample the quality. In general, only the "exclusive" high budget chocolate companies buy beans at the plantation. Here’s how it works: After the beans are fermented, dried and cleaned, they are placed in sacks (at the plantation). Government inspectors visit the plantation and take a large sample from the sacks. They split the beans lengthwise and classify them by grades -- "fine grade," "second grade," and "third grade" are determined by the color of the beans. The beans are then taken by truck to a seaport. More inspections will take place at this port of departure, and a final one just before loading. In general, cocoa beans are purchased at the country of origin by private import- export traders or international brokerages or exchanges; the beans are then sold to negotiators, who supply various chocolate manufacturers. By cutting open a number of beans, they can tell if the beans are properly fermented. Purple centers indicate incomplete fermentation. Buyers look for specific characteristics. Madagascar beans are strong in flavor and aroma. 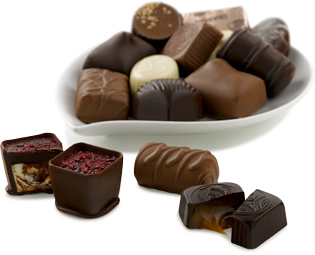 But most chocolates are the result of a blend of cocoa beans. A slightly acrid bean, such as those grown in Trinidad, might be an excellent in a certain blend. The beans are packed in 130 to 200 pound jute sacks, weighed and classified, and the tropical fruit is stowed in the holds of freighters, crossing oceans to the great ports of Europe and North America. Upon arrival, the beans are cleaned, selected, blended, roasted and ground, determining much of the chocolate's final character in the process.